Eating Raw till 4 is easier than you think! Especially if your making delicious recipes that keep you full till the afternoon. 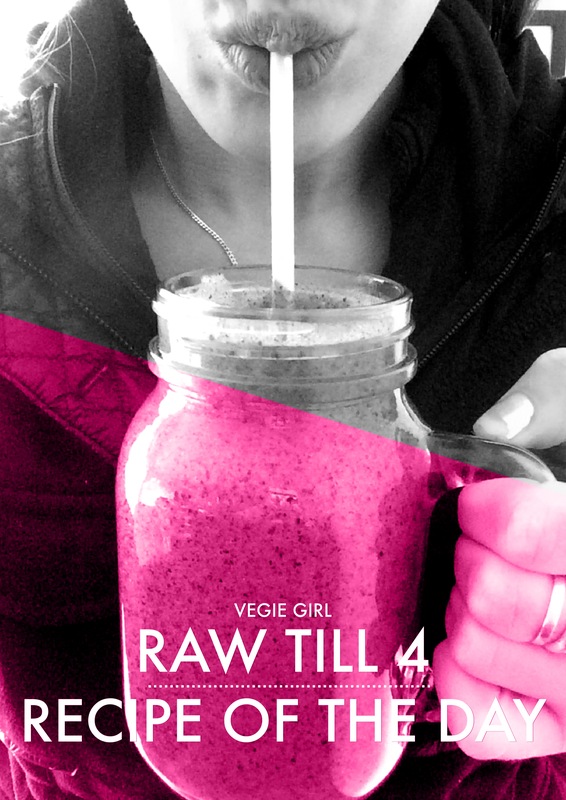 Generally when eating Raw till 4 I start the day with a smoothie or freshly squeezed juice. I will have an entire jug to myself. Don’t be afraid to drink a lot of it! A big smoothie in the morning will keep my full until about 2 or 3 in the afternoon. Then late Lunch I have a raw salad or possibly some rice paper rolls, nori wraps or lettuce cups. For dinner I love my Vegie Curries during winter, stuffed baked sweet potatoes or a yummy pumpkin soup. If I ever feel like a snack I will have a banana and a few dates, or a bowl of berries. This smoothie is packed full of antioxidants and nutrients that are going to help curb cravings during the day and will also hydrate your body giving you the perfect start to the day. Remove the pips from the dates and the banana peels. Place all the ingredients in the blender and blend until smooth. Add additional water or coconut water till the smoothie is the thickness of your liking.